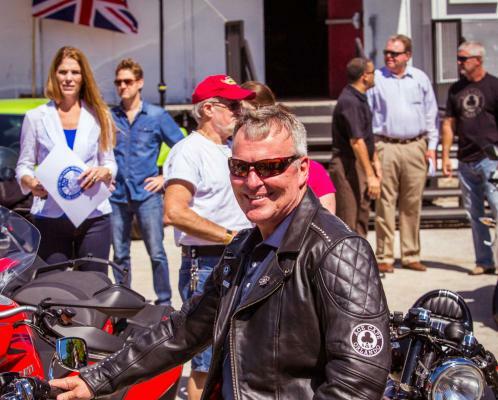 ORLANDO, FL – Ladies and gentlemen, start your engines: Ace Cafe Orlando, the first North American location of the celebrated London-based cafe, makes its world debut on Friday, May 19. Guests are invited to kick-start the grand opening weekend of the all-new, full-throttle, rock ‘n roll destination Ace Cafe with a cuppa coffee and tea when the Ace officially opens its doors to the public on Friday at 7:00 a.m., then stay to enjoy an action-packed weekend of festivities at the 35,000-square-foot motor-centric dining, entertainment and retail destination. North America’s newest home for all who share the passion for speed, thrills and rock ‘n roll is waiving the green flag, signaling that it’s “go time” for Central Floridians and guests from around the globe to celebrate the heritage and history of the most famous cafe on the planet. All three days of grand opening weekend will feature cool cars and hot bikes, live rock ‘n roll inside and outside both day and night, a BMW RnineT Racer motorcycle raffle benefiting Arnold Palmer Hospital for Children (APCH), live demonstrations by three world-famous artists, onsite activities and brand partner merchandise (while supplies last), and a free Friday night concert by Rockin’ Jason D. Williams – direct from Memphis, about whom Rolling Stone magazine says “There hasn’t been raw rockabilly this solid since Jerry Lee Lewis, himself.” A snapshot of Ace Cafe Orlando’s grand opening weekend celebration is listed below; visit www.acecafeusa.com to stay up-to-date on the Ace’s grand opening happenings. The first Ace Cafe in the USA opens at 7:00 a.m. Grab a cuppa Julius Meinl coffee - direct from Vienna; tea and grab ‘n go breakfast bagels, muffins, burritos, croissants, and cinnamon rolls also available. Music in the car park (parking lot) starts at 4:00 p.m. with live rock ‘n roll lasting well into the night. Taking the stage at 8:00 p.m. is headliner Rockin’ Jason D. Williams. Carbs & Caffeine at 7:00 a.m. Kick-start Saturday morning and drive in for an early morning cuppa! Ace Cafe’s Cool Cars for Kids to benefit APCH. For a $15 donation per car, participants can be a part of the opening weekend car show and receive a limited-edition Ace Cafe grand opening t-shirt. Hungry? Start the day with a bang at Ace’s 4-Banger Brunch at 9:00 a.m. (a buffet-style, all-you-can-eat brunch served every weekend). Free activities in the car park starting at 10 a.m. with a variety of local partners and vendors engaging Ace fans until 5:00 p.m.
Live music starts at 4:00 p.m. outside with live rock ‘n roll into the night. Bikes & Bacon at 7:00 a.m. Kickstart Sunday morning and ride in for an early morning cuppa and Ace’s Bacon of the Week! Ace’s 4-Banger Brunch kicks off again at 9:00 a.m, with full lunch menu starting at 2pm. Free activities in the car park starting at 10 a.m. with a variety of local partners and vendors engaging motor fans until 5pm. Ace Cafe Orlando is located at the corner of West Livingston Street and Garland Avenue on a three-acre parcel in downtown Orlando in the extensively refurbished 100-year-old Harry P. Leu buildings (the former home of The Edge rock venue). The new “Ace Corner” is adjacent to the modern SunRail locomotive station and is a direct ride to the world-renowned Daytona race circuit via Interstate 4. The Ace spans two floors and features a full-service restaurant, two kitchens, four bars, a coffee bar, a communal counter, a mezzanine overlooking the main floor dining area and stage, private and semi-private group spaces, retail shops, and a motor-inspired art gallery. Boasting delectable and affordable American diner fare with a twist and also featuring authentic British favorites, Ace Cafe Orlando connects great food and dining with a passion for motoring and live rock ‘n roll, providing a totally unique experience found nowhere else in the U.S.A. Ace Cafe is the most famous motor-diner on the planet. Since 1938, Ace Cafe London has been a mecca for those passionate about cars, bikes and rock ’n roll culture. The original location on London’s North Circular Road began as a simple roadside cafe for truckers, then evolved into a popular destination for rock ‘n roll-loving teens riding motorbikes during the '50s and '60s. Today, the Ace has a multi-generational appeal from motorsports enthusiasts from all over the world. Ace Cafe North America holds the exclusive licensee rights in North America and South America for this world-famous brand. Ace Cafe Orlando is the first North American venue for Ace Cafe. For more information, visit www.acecafeusa.com, and connect on Facebook, Twitter @AceCafeOrlando and Instagram @acecafeorlando_official.